Chia is an edible seed belonging to a flowering plant from the mint family. The seed is native to Mexico and has been a staple in the Aztec and Mayan diet for centuries. Back then also, chia seed was considered a super food owing to its medicinal properties. The Aztec warriors used chia seeds as their main source of fuel during conquests. They also used it to relieve joint pain while staying in the conquests. This tiny seed comes in both white and black color and is highly nutritious. Chia seed has a huge nutritional profile. This concentrated food contains calcium, biotin, thiamine, manganese, phosphorus and copper. Chia is a great source of omega 3 fatty acids and fiber. It also contains numerous phytochemicals, phenolic acid, lignan, and flavonols like quercetin, kaempferol and myricetin. An ounce of chia seeds provides 139 calories and 9 grams of fat. Moreover, the seeds are gluten free and extremely low in carbohydrates. Chia seeds have been used since time immemorial to treat a wide range of health conditions and diseases, like cold, flu, skin problems, lack of stamina and energy and joint inflammation. There is also some evidence that chia seeds can reduce the possibility of cancer. Read on further to know some of the popular health benefits of this super food. A balanced blood sugar level is highly important for proper health and energy. Deteriorating insulin sensitivity is a precursor to type two diabetes. Chia seed is believed to be a potential natural treatment for type 2 diabetes. It helps to improve insulin sensitivity and glucose tolerance. The soluble and insoluble fiber present in Chia seeds slow down how fast the body converts carbohydrates into simple sugars, controlling blood sugar levels. A balanced blood sugar level not only reduces the risk of type 2 diabetes, but also ensures steady energy levels throughout the day. 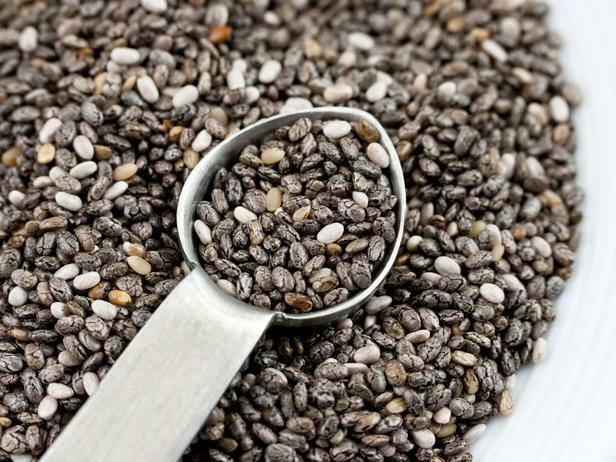 A one-ounce serving of chia seeds provides you with a whopping 11 grams of dietary fiber. This amounts to one third of the total value of fiber intake. Fiber is essentially important for regulating the bowel function. About 20% of the fiber in chia seeds is soluble in nature. It feeds the good microbes in the gut, promoting a healthy digestive system. It speeds up the excretion of waste and toxins from the body, preventing the build up in the intestine. This makes chia seeds highly beneficial for people suffering from irritable bowel syndrome. Fiber also helps to reduce inflammation and lower cholesterol levels in the blood. A single serving of chia seeds provides 18% of the daily value of calcium. Calcium is required for maintaining bone and dental health. It slows down the bone mineral density loss, thereby preventing osteoporosis. It also contains phosphorus, which is equally important for maintaining bone and teeth health. Did you know that you could lower your cholesterol levels by adding chia seeds to your diet? According to the several studies, chia seeds have been known to improve the blood pressure and reduce cardiac inflammation. It also increases healthy cholesterol, while lowering the low-density lipoprotein levels. The potential cardiovascular benefits can be attributed to its high ALA content. The body cannot synthesize ALA; hence, it is important to get enough of this nutrient to support the immune system. ALA can also prevent high triglyceride levels, reducing central obesity. Chia seeds are extremely rich in antioxidants. In fact, it contains even more antioxidant than blueberries. The high antioxidant content protects the body from free radical damage, one of the main causes of premature ageing and cancer. Free radicals also lead to the inflammation of various tissues. The high antioxidant content in the chia seeds prevents the oils from going rancid, contributing to its long shelf life. Chia seeds can last more than two years, even without refrigeration. Chia seeds absorb a lot of water. They bulk you up quickly and keep you full for longer times. This helps to reduce the food cravings between the meals. Unlike flax seeds, chia seeds can be digested whole. They do not need to be ground to obtain the nutrients present in them. A healthy weight management is of utmost importance in leading a healthy lifestyle. As mentioned earlier, chia seeds, when exposed to water, thicken and absorb water, keeping you full for longer time. They even reduce the cravings by preventing the food from getting absorbed in the system. It also releases energy slowly. All these factors combined can help you shed pounds. The gel is made of water and has no calories whatsoever. This means that it can help you stay full without adding calories. The essential fatty acids in chia seeds help to boost the metabolism and promote lean mass. Italso helps to reduce fat accumulation around the abdominal area. The excess consumption of processed and refined foods does more harm than good. They are mainly responsible for contributing to the rise of diverticulitis. To prevent this condition, you need to consume plenty of soluble and insoluble fiber. Chia seeds contain both soluble and insoluble fiber, which have their own share of benefits. The insoluble fiber keeps the food moving smoothly throughout the digestive system, while soluble fiber keeps the colon hydrated. The swelling actions of chia seeds help to cleanse and soothe the colon, while lubricating and strengthening the peristaltic action. Chia seed is renowned to increase the energy levels. Athletes all across the world consume chia seeds on a regular basis. The hydrophilic properties of chia seeds help to enhance the energy. It also keeps the body hydrated for longer times. In addition, the protein content in chia seeds, along with vitamins and minerals raise the energy levels. Chia seeds are a great source of protein for the vegetarians. A 28 grams serving of this seed provides 4.5 grams of protein, equaling to 10% of the daily value. It also contains strontium, which helps to assimilate protein and produce high energy. Not many are aware of the joint pain relieving properties of chia seeds. The high levels of omega 3 fatty acids in chia seeds ease the pain of bones. It lubricates the joints and keeps them supple. The omega 3 fatty acids are further converted into prostaglandins, which provide the pain relieving and anti-inflammatory effects. Chia seeds are one of the best plant based sources of omega 3 fatty acids, mainly alpha linolenic acid. Its lipid profile is composed of 60% omega 3 fatty acids. A one-ounce serving contains 5 grams of omega 3 fatty acids. These fats are very essential for optimal cognitive performance and are referred to as the brain food. It makes the cell membranes more flexible and nerve transmission more efficient. A regular consumption of chia seeds can enhance memory and reduce the risk of Alzheimer’s disease in the elderly. Chia seeds are loaded with antioxidants, which provide its strong immune boosting properties. Chia seeds have a remarkable antioxidant rating of 1909, much more than several fruits and vegetables. It also contains zinc, which plays an important role in the antioxidant defense system of the body. A French study has found that alpha linolenic acid could induce the apoptosis in certain types of cervical and breast cancer cells, without damaging the non-cancerous cells. Apoptosis is a body’s natural way of eliminating the damaged cells. However, the cancer cells develop a mechanism that enables them to evade apoptosis. This allows them to grow uncontrollably. Chia seeds impact on other types of cancers are unknown. The high levels of antioxidants in chia seeds make it very beneficial for the skin health. Antioxidants slow down the ageing of the skin by destroying free radicals, the molecules that wreak havoc on the tissues and cells of the body. Omega 3 fatty acids and vitamin E naturally condition the skin, preventing wrinkles and fine lines. It also prevents breakout. Chia seeds contain several hair healthy nutrients like zinc, thiamin, niacin, iron and copper. Copper prevents premature greying of the hair, while protein is crucial for healthy hair growth. Zinc promotes the blood circulation in the scalp, giving you a healthy and strong hair. While purchasing chia seeds, avoid those that are red in color as the color signifies that they were plucked prematurely. Black seeds that are smaller than the regular chia seeds should also be avoided. You can purchase the seeds in its whole, bran, oil and ground form. Chia seeds can be eaten raw or can be added to a number of dishes. Chia seeds are tasteless, so you can easily integrate them in your meals. Moreover, they are absorbent in nature and acquire a gelatinous texture when soaked in water. You can sprinkle the chia seeds on your salads, pasta, and cereals. Add the milled chia seeds to your smoothies and oatmeal. They are also used widely in baked goods. Chia Fresco, a traditional Mexican dish is prepared by soaking chia seeds in fruit juice or water. Do not consume more than 2 tablespoons of whole chia seeds and drink plenty of water.